Intaglio is a technique which dates back to antiquity and is still in use at present. Patterns, designs or – more frequently – images are carved or engraved in gemstones leaving a hollow impression in the untouched background. This style of carving is the opposite of the cameo technique. By the nineteenth-century, intaglios were not considered optimal for jewelry; Victorians preferred cameos. Intaglios were relegated almost entirely to fobs and seals. 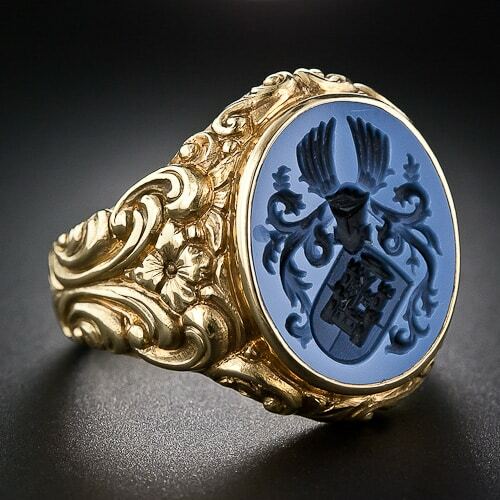 In 1840 the postage stamp virtually eliminated the need for wax seals and the art of the intaglio began to wane.